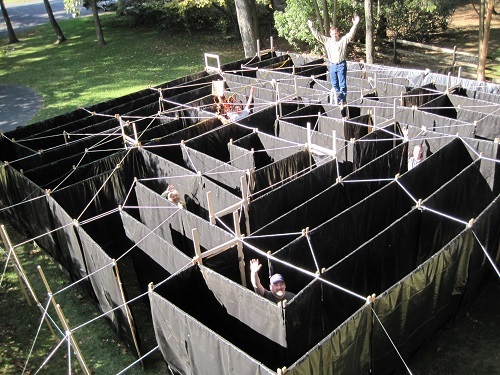 Design the maze with www.mazegenerator.net and build the maze with hessian and stakes (poles). Make your fete or event a little more interesting. Funding can be from sponsorship as well as ticket sales. There is plenty of wall space. 1.8 metre high hessian is around $6.98 per metre length at Bunnings or at Gotstock.com.au 1.83m x 50M roll is around $105 ($2.10 per metre).